SAN DIEGO— Capt. Charles (Charlie) Sharp, 70, of Carlsbad, passed away in his home on Feb. 27 due to leukemia. He was surrounded by his loved ones when he took his last breath of life. Capt. Sharp was born June 17, 1944 in Lubbock, Texas and graduated from Burges High School in El Paso. He graduated with a Bachelor’s degree in business from the University of Texas at El Paso. He was a consummate business man with a creative and entrepreneurial spirit and over the course of his life worked as a disk jockey, advertising executive, executive recruiter, and finally as a small business owner of a floor covering company which he operated in San Diego for more than 25 years. Those who knew Charlie also knew that his true love was sailing and thus was an active member of the sailing community in San Diego. He had 33 years of pleasure craft experience in Southern California, the Gulf Coast, the British Virgin Islands, French Polynesia and the Florida Keys. 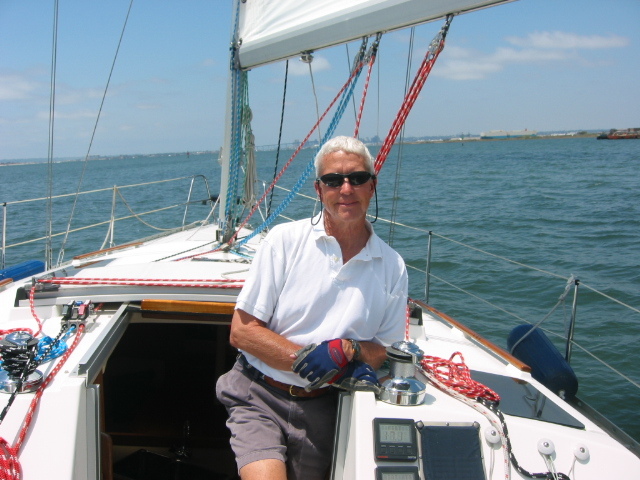 He attained his professional licensure with the U.S. Coast Guard as a Licensed Master 100 ton with sail and towing endorsements, and also with the American Sailing Association as a sailing instructor for Harbor Island Yacht Club, Harbor Sailboats, San Diego Yacht Charters, and Marina Sailing. He took the helm as a charter and delivery captain, and enjoyed racing with Cortez Racing Association in San Diego. He and his wife, Katie, enjoyed many sails on their 35.5 foot Hunter Legend Patriot, and 22 foot Capri, Hot Dog. Charlie will be deeply missed and dearly remembered by his family, friends, sailing comrades, and all those who loved him. He is survived by his wife, Katie Alexander of Carlsbad, daughter Lauren Sharp of Oakland and his buddy Skipper the Beagle. A memorial service will be held in his honor in Point Loma at noon, Tuesday, March 17 at All Souls’ Episcopal Church, 1475 Catalina Blvd. in San Diego.